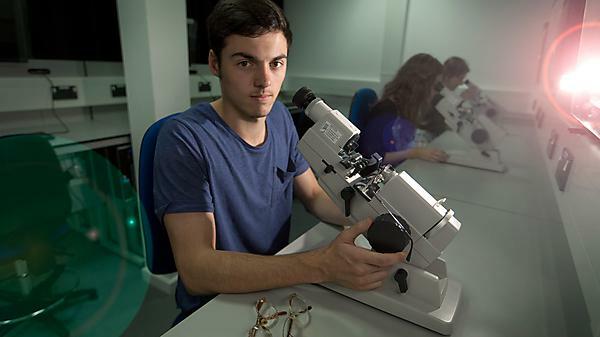 During your degree you won’t just be learning about the fundamentals of optometry; you’ll also be studying with academic staff who are continually looking into new aspects of the science and how it affects patients. As part of the Eye and Vision Research Group – one of the research clusters within the Centre for Health and Social Care Innovation – their work has a strong clinical focus and feeds into what you’ll learn about the subject and the way it’s practised. From your second year onwards you’ll be able to get involved in the group’s research projects and in the third year, as part of your degree studies, you’ll complete an individual research project of your own. What projects do they work on? Members of the group also work with fundamental scientists and other health care professionals to create multi-disciplinary projects about eye care and beyond.